On vacation and arrived in Gloucester this afternoon. It’s lovely to be back after almost 6 months. So what’s a boy got to do? Visit the cathedral of course! Decided I would go to Evening Prayer at 16:30 which was in the gorgeous but intimate Thomas Chapel. There was just two of us in attendance and it was lovely to meet up with Canon Celia who lead the service. Later in the evening, attended a concert in the beautifully restored Lady Chapel by the Glevum Consort. The main work was a performance of Thomas Tallis’ “Missa Puer Natus Est”. On the Sunday, spent most of my day at the cathedral attending the morning sung Eucharist, Evensong then finishing off with Compline. It was a really lovely day with lots of glorious music and singing in this magnificent building. 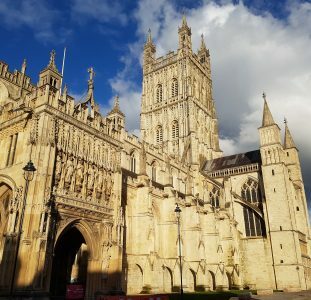 My stay in Gloucester ended with the news that one of my pictures won the cathedral’s Christmas Instagram competition. I’ve used this picture as my main one for this post along with some other lovely shots from my time here.